I’m not sure when my life started revolving solely around zines but here we are. And you’ll get no complaints from me! In fact, I have a few exciting announcements to make! First, my most recent zine is available now! 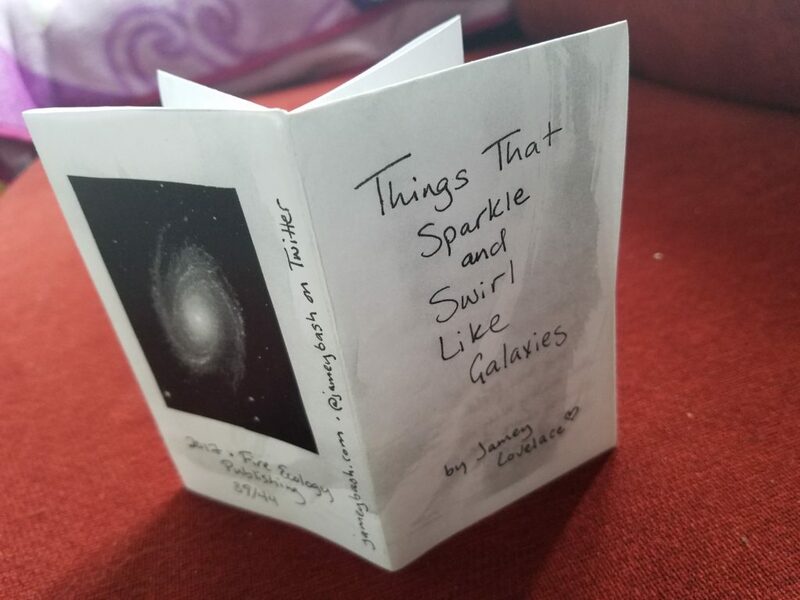 It’s called “Things That Sparkle And Swirl Like Galaxies” and it’s tiny and cute, has a space theme and features some poetry that I’m very proud of! I’m selling it for $1 in Buffalo or $2.50 including shipping if you’d like me to send it to you! Also if you’re interested in how I put it together, check out my tutorial from last week which will teach you how to make an adorable one page zine (with this new one as an example)! This past weekend, I participated in the Sugar City Zine Fair for the first time, which is a really fun event that I was so glad to finally be a part of. I was selling all three of my current zines for a special bundle price – and if you weren’t able to make it, I’d like to extend the sale for everyone. If you want all three of my current zines – Meep Morp #1, Self Care & Things That Sparkle And Swirl Like Galaxies – I’ll mail them all to you for $15 including shipping (which is cheaper than picking them all up separately)! 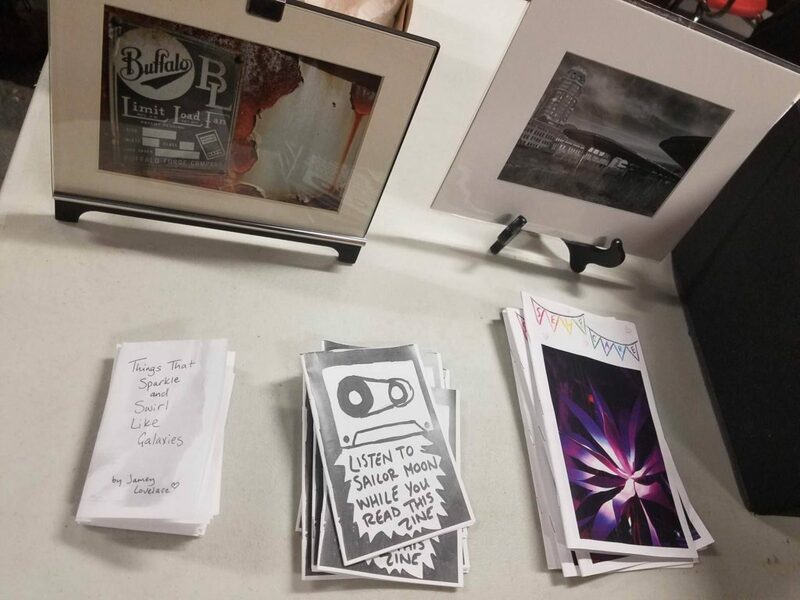 My wares for sale, including the 3 zines you can buy from me! Speaking of Sugar City, I saved the most exciting news for last! 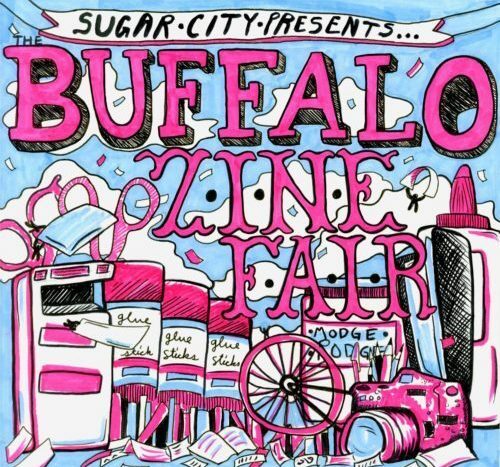 Sugar City, if you’re not familiar with it, is an awesome art space on the west side of Buffalo that has an amazing zine library which anyone is welcome to visit and read zines until their heart’s content. And last week, I took a position there working as the new zine librarian! That means I’ll be taking care of the collection, taking and categorizing donations and hopefully organizing some zine events and poetry readings in the near future! I’m also curating a wall of featured zines based on some of my current favorites, kind of like record shops sometimes do. It’s an extremely awesome place and I’m really honored to be a part of it now. If you’re interested in getting involved at all, our first zine committee meeting will be on July 27th at 7pm! My curated wall of zines! 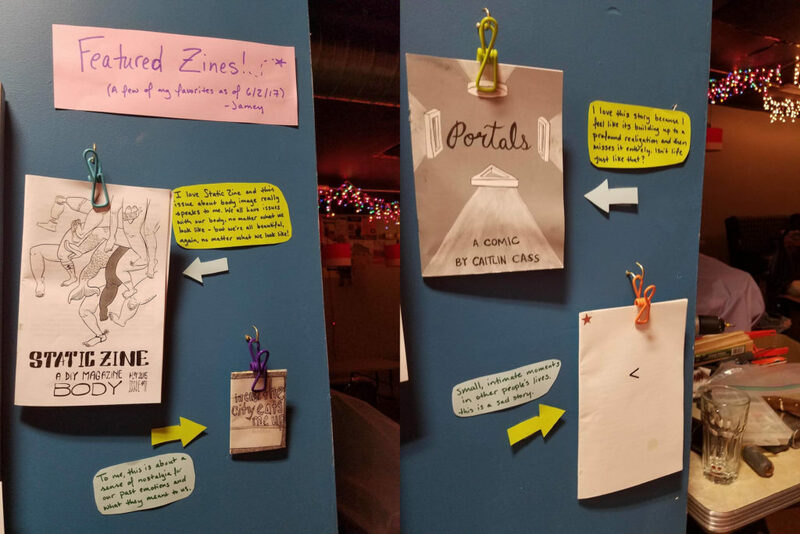 Also, if you’d like to donate some reading material to the library, either your own work or zines from your personal collection, we’d love to have them! Send them to me at this address and I’ll make sure they get on the shelves for people to enjoy ASAP! When I take on a new project, I feel excited but I usually also feel a sense of anxiety. Will it be too much? Will I do a good job? Will I create a stressful situation for myself? Even though becoming more active at Sugar City will likely be a pretty big commitment of time, I feel really deeply good about the decision to get involved and feel a sense of peace when I think about my new responsibilities there. I think this is going to be good for me and good for my community and I feel very, very positive about this chance to give back to a space I love in a neighborhood I love and I encourage everyone I know to get involved in whatever way feels right to them, big or small.